There are a couple of different variants on offer here but they all include 8th Gen Intel Core CPUS, Nvidia RTX Series graphics cards, Samsung DDR4 RAM sticks, a Killer 1550 Wi-Fi adapter and a matching pair of Intel's own 760p SSD storage solutions. If you go for the higher-end Y9 variant, the AERO 15 comes integrated with an Nvidia RTX 2080. If you choose the cheaper X9, it'll come with an Nvidia RTX 2070. 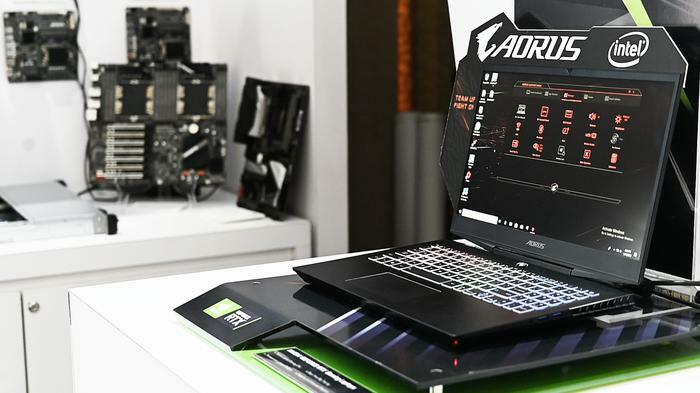 Rather than opt to build a dedicated gaming or performance laptop, Gigabyte are trying to position the new AERO 15 as a conqueror of both worlds. To that end, the new AERO 15 also features a fully-lit RGB keyboard with N-key rollover and support for Windows' Precision Touchpad feature. Then, there's the Microsoft Azure integration. Gigabyte say that by processing data through Microsoft's Azure A.I via the cloud, the new AERO 15 will be able to learn and adapt to the unique user preferences throughout the laptop. They cite things like keyboard preferences, fan modes or CPU and GPU wattage control as things that the AERO 15 is able to learn and adapt to. Whether that actually translated into a compelling advantage over the other options remains to be seen. This AI integration sounds a little vague but somewhat-reminiscent of the promises that ASUS is making around Project Precog - the futuristic laptop they showed off at last year's Computex - and some of what Huawei is doing with their Kirin 900 series CPUs. No word yet on any sort of local pricing or availability but expect more details to come to light over the course of this year's CES - which unfolds this week.